A sobering article from Reuters points to potential credit problems with commodity buyers in China. It seems some middlemen have in the past been taking speculative inventory with the goal of earning more than the usual spread. As demand slowed, these buyers are having trouble raising cash to meet their obligations. They typically relied on rapid sales to their customers to purchase new inventory - but that does not seem as easy these days. Anecdotal evidence also suggests that wholesalers are cutting coal inventories in a number of ports. 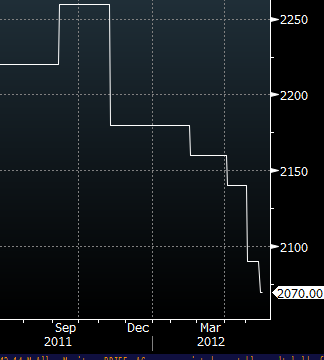 Spot prices for coking coal have indeed been dropping. These events may be an indication of a demand slowdown in China that is far sharper than anticipated - driven primarily by reduced infrastructure investment (discussed here). A more aggressive stimulus program from the government may be on the way shortly.